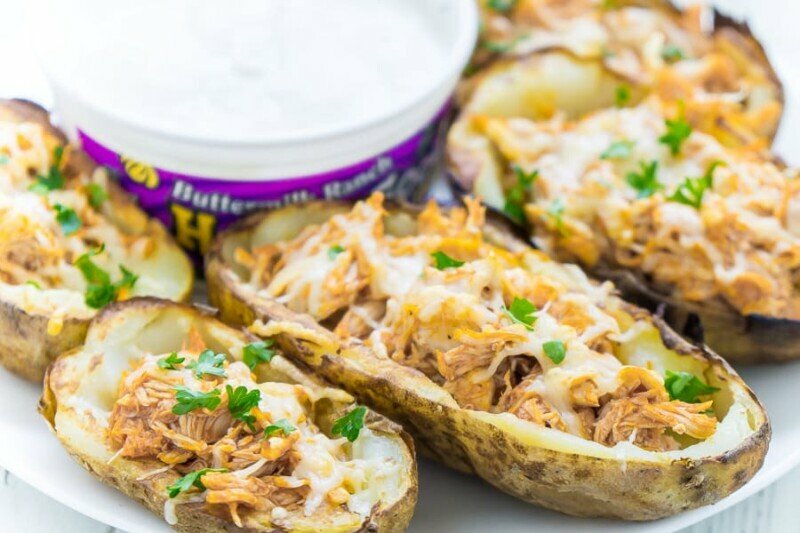 This buffalo chicken stuffed potato skins recipe is the perfect football party food! 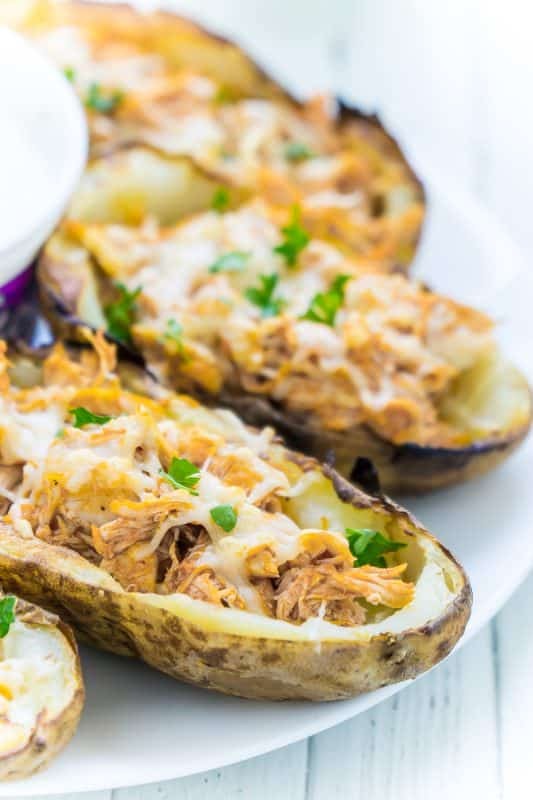 These potato skins combine two appetizer favorites – buffalo chicken dip and potato skins – in one delicious recipe! Pair these loaded potato skins with a little ranch dip to cool down the heat. One of my favorite appetizers is buffalo chicken dip. To be honest, I’m a little obsessed with buffalo chicken dip. I’ve made regular dip, buffalo chicken flautas, buffalo chicken cups, buffalo chicken rollups, and more! 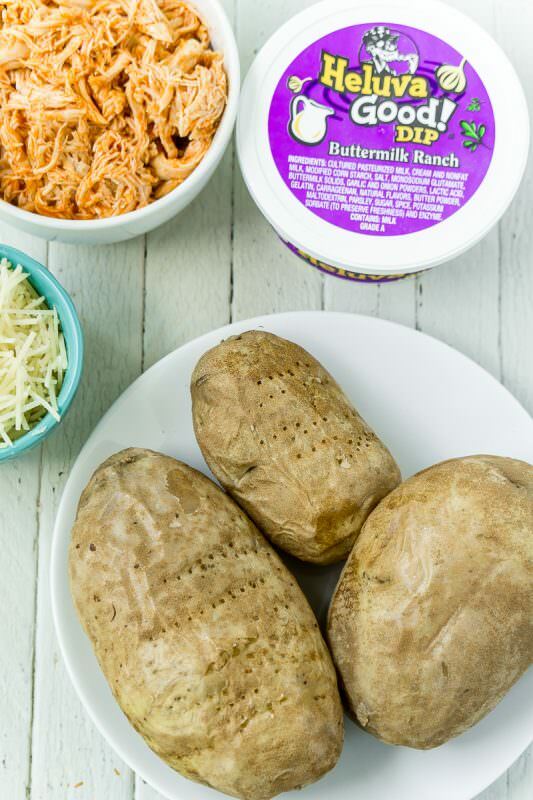 It’s only natural that I’d combine buffalo chicken dip with another favorite of mine – potato skins. I normally like the crispy potato skins that are filled with cheese and bacon but decided to change things up with this recipe and combined them with my favorite buffalo chicken flavor instead. I normally eat buffalo chicken dip with corn chips for the crunch, but these potato skins do the exact same thing. You get the crunch of the potato skin, the heat from the buffalo chicken, and the cheesy goodness on top. I don’t eat onions but if you like the added flavor of chives, feel free to chop up a few and toss them on top. If you skip the cheese on top, these would also work well as a yummy Whole 30 recipe! The best part about this recipe is that it’s so easy. You simply bake the potatoes, dig out the insides, then broil again until crispy. Fill with buffalo chicken, top with some shredded Parmesan or Italian cheese, and broil again until the cheese is melted. Other than baking the potatoes, which can be done way ahead of time, you could really have these ready to go in like 15 minutes tops. Easy. These stuffed potato skins would make the perfect game day party food! Simply plate them with a tub of Heluva Good Buttermilk Ranch Dip (my favorite of their dips) and some carrots and celery, and you have one satisfying and filling appetizer that everyone will love. Even better if you make these bacon ranch sliders for your party table too! Or use some of the leftover buffalo chicken dip to make this buffalo chicken pizza! You can find the Heluva Good Buttermilk Ranch Dip along with other varieties in your local grocery store (find a grocery store near you that carries them) in the dairy case. 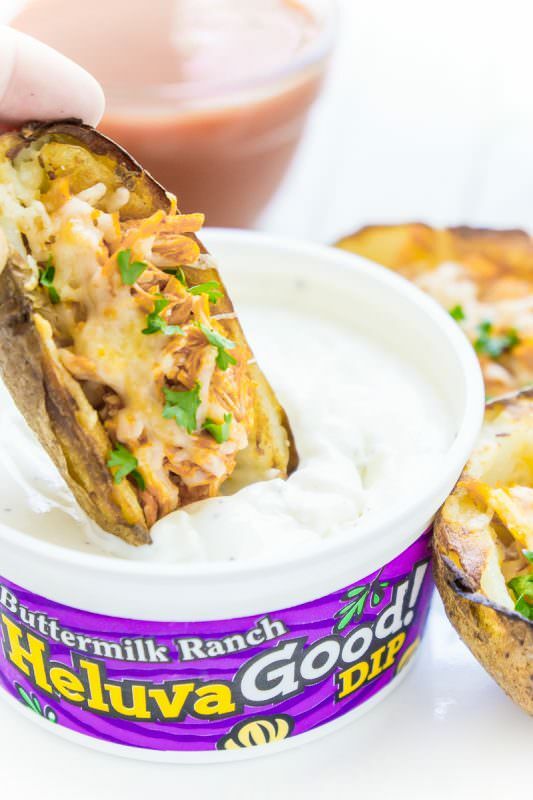 I used ranch with the potato skins because it’s my favorite but you could easily pair it with one of the more unique flavors like white cheddar and bacon or jalapeno cheddar instead! The ranch dip really does a fantastic job of cutting the heat from the buffalo sauce. If you’re worried about them being too hot, half the amount of buffalo sauce it calls for in the recipe and have some extra on the table for people to add more heat as needed. I know some people can’t handle as much heat as others! 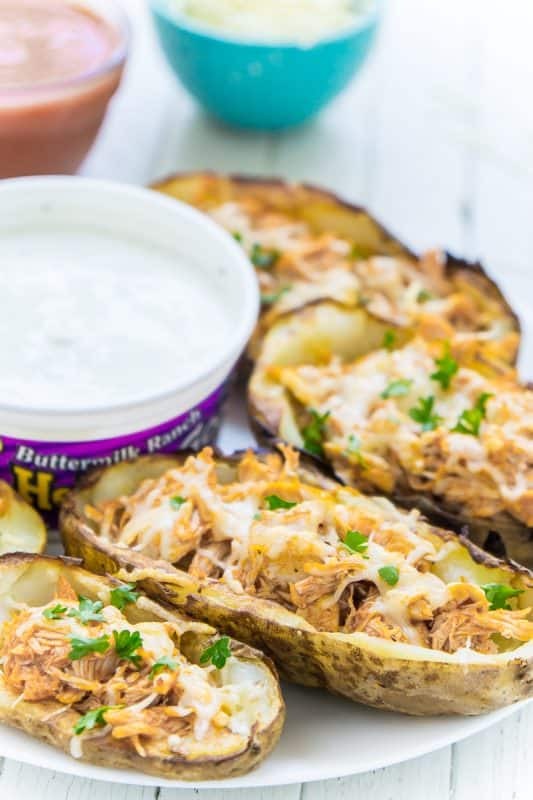 This buffalo chicken stuffed potato skins recipe is one of the best appetizer recipes ever! It’s easy, quick to make, and loaded with homemade buffalo chicken filling! Poke holes in potatoes with fork. Place directly on rack in oven and bake for 50-60 minutes or until potato is tender. While potatoes are cooking, combine shredded chicken and buffalo sauce until chicken is coated. Remove potatoes from the oven and allow to cool until they are cool enough to handle. Cut potatoes in half lengthwise with a knife. 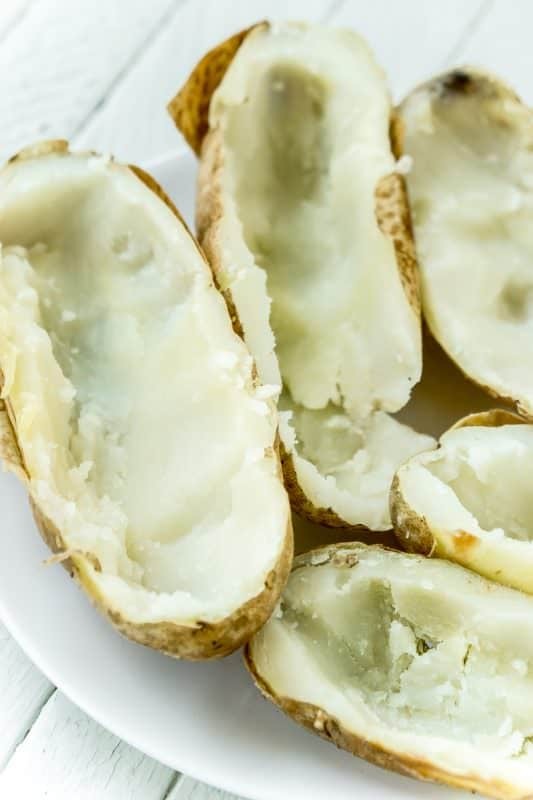 Use a spoon to remove most of the insides from the potatoes, leaving about 1/4 inch of potato all the way around inside of the skin. Set aside potato scooped out to use for another purpose. Turn oven on to broil - high. Place potato skins on a baking sheet and baste with butter then salt and pepper. Flip then do the same to the other side so both sides are buttered and seasoned. Broil potato skins on one side for 3 minutes, keeping a close eye on the potato skins so they don't burn. Remove from oven and flip. Broil for another 3 minutes on the other side. If they are start to burn, remove immediately from oven. 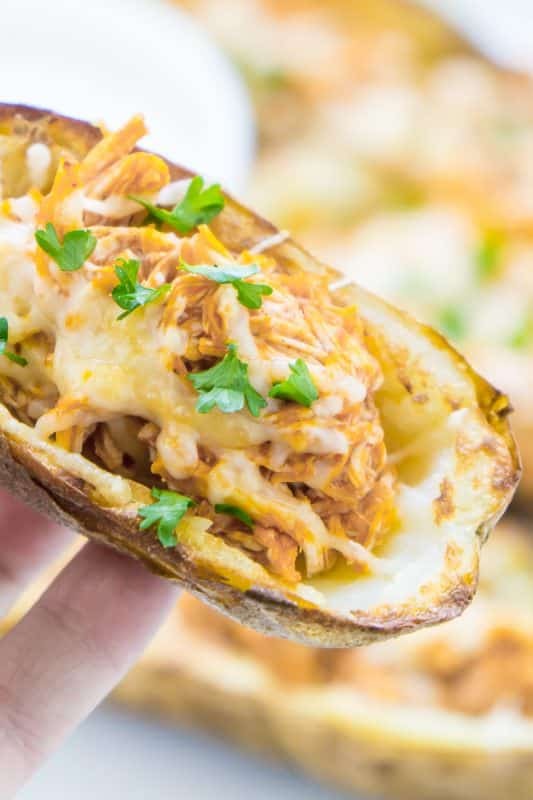 Fill potato skins with buffalo chicken mixture and top with shredded cheese. Broil again for another 3 minutes or until cheese on top is melted. Top with parsley or chives (optional). Serve hot and with Heluva Good Buttermilk Ranch Dip for dipping. 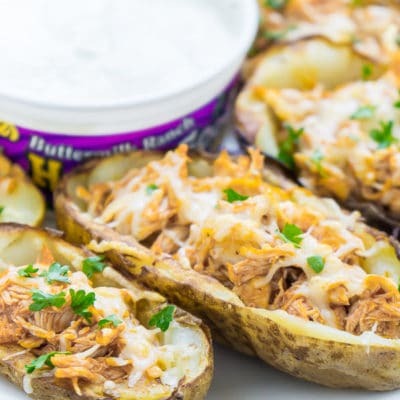 Don’t forget to pin this buffalo chicken stuffed potato skins recipe for later! We had people over to watch a football game and I made this and everyone loved them! Thanks so much for the recipe! We love potato skins and buffalo wings so this combination is a winner with my family! Thanks for a great recipe!